One of the speakers at Thursday’s Worcester Tea Party meeting was Nathan Fatal, a recent Political Science grad from the University of Massachusetts. While at U. Mass., Nathan founded the New England Objectivist Society to promote the philosophy of Ayn Rand. In this effort, he connected with liberty activists across Massachusetts and he was a speaker at our 2012 Tax Day Tea Party in Lincoln Square. dogma. You can imagine the challenges that confronted him in his efforts to convince his fellow students that individual liberty was preferable to the collectivist ideology that was instilled in them in the classroom. He was frustrated by the futility of his task, but he didn’t give up. He learned. What Nathan learned is something that the Tea Party movement needs to learn. Trying to get students to show up at a meeting to talk about Ayn Rand had become a waste of time. Nathan was committed to getting his message out to his fellow students though, so he switched tactics. He started to use Dale Carnegie’s philosophy of “How to Win Friends Influence People”. What Nathan learned was that he needed to relate his message to each individual that he was speaking to. This personal connection allowed his listener to receive Nathan’s message in a completely different light. The responses that he started to receive were much more positive. Nathan and his coalition of college students are a major reason that liberty will thrive in the United States and around the world. They are part of a cultural wave that will wash away the Progressive ideology that has sickened our society for almost 100 years. Let’s use their wisdom to promote the Tea Party message. Bashing our opponents with insults does nothing to win the support of our fellow citizens who hover in the center of the political spectrum or who have only been exposed to the toxic agenda of leftist academics. We cannot do this with a negative message. Our message is one of optimism and faith in individual Americans. By being more careful with the words that we choose, we can win more supporters. Addressing the faults and philosophical ignorance of today’s politicians will only yield a short term victory, because these politicians will be replaced by similar charlatans. We need to destroy the dangerous ideology of these politicians. What we need to win is a cultural change, one where Americans once again value their freedom. We must strike at the root. Many Tea Party members are not sure what their role is in the movement. If you are not comfortable with getting involved at the organizational level, there is a simple, effective, and very important role for each of you. You are our messengers. One of the most effective ways to promote the Tea Party message of limited government, fiscal responsibility, and adherence to the Constitution is by writing a letter to the editor. Well written letters supporting our cause can light brushfires in the minds of people who may not fully understand the nature of the challenges facing our country. They also give us an opportunity to show that freeing the individual from the chains of a bloated and oppressive government is the most effective way to raise every American’s liberty and ability to pursue happiness. Grab the readers’ attention in the first sentence. State your opinion clearly in the first paragraph and repeat it in the last paragraph. Do not use personal attacks. Don’t rant. Back up your opinion with facts. Verify your facts. Giving your opinion is important, but you should also offer solutions. Remember though, often the best solution is to do nothing! Be positive! Explain the value of freedom. Be optimistic. Keep your letter to 250 words or less. This is very challenging, but many newspapers have word limits and readers will completely read a short letter. The Worcester Telegram has the widest readership in our area, but weekly local newspapers shouldn’t be overlooked. Your neighbors and friends are more likely to be influenced by your well written opinion. Get in the habit of writing letters every month. Most newspapers will limit you to once per 90 days, but if you choose three newspapers, then you can rotate one per month. Some of our members have volunteered to help with proof reading letters and helping you polish your message. They can offer as much or as little help as you need. 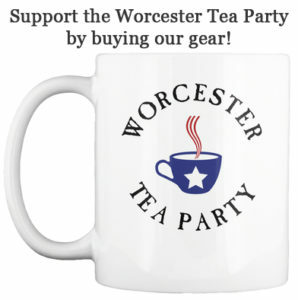 You can contact them at:Letters@www.worcesterteaparty.com. You can use the same email address to tell us when your letter is published, so we can let everyone know to comment on it. Be prepared to be ridiculed in the online comments. Don’t respond with the same kind of vile nastiness that they throw at you. If we can get our message out this way we can influence public opinion and ensure that our children will live in culture that values freedom.